Balancing on a large surfboard when the waters are calm or riding the big waves with the help of a paddle, you are sure to have a great time paddle surfing. Nature is certainly one of Ibiza's main attractions: the coves with turquoise waters, the pine forests that create a green backdrop throughout the year, the many islands surrounding the main island, in addition to a mild climate all year round. 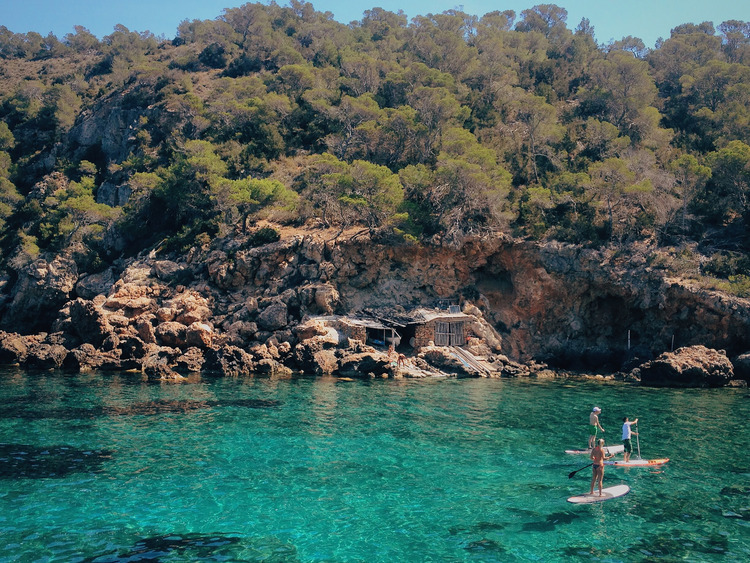 It is also thanks to these features that Ibiza is the perfect destination for those who love water sports including paddle surfing, which is undoubtedly ideal for enjoying the crystal clear waters surrounding Ibiza to the full. Waiting for the sunset and armed with the equipment that is made available to us, we have the opportunity to admire the sea around the island of Ibiza as we paddle surf at sunset in the waves lapping the shoreline of the Platja d'en Bossa. We also have plenty of time to take some photos of this extraordinary landscape.